Rhinoscopy of the nose is one of the most simple but effective methods for inspecting the nasal cavity in otolaryngology, the most commonly used in clinical practice ENT physicians. With the aid of rhinoscopy, the doctor gets the opportunity to explore the structure of the nasal cavity and its walls, and indirectly to explore the paranasal sinuses, which is very important in the diagnosis of several diseases (sinusitis, frontal sinusitis, etc.). There are two types of procedures: anterior and posterior rhinoscopy, characterized by the method of inspection. Special mention to endoscopic kind of research that would expand the capabilities of the inspection and to improve the accuracy of diagnosis. The survey is visual examination of the nasal cavity using a special device or mirror. The need for examination of the nose in diseases of the cavity (different types of rhinitis, both acute and chronic). Suspected tuberculous process in the mucosa of the nasal cavity. Different types of sinusitis with lesion of maxillary, frontal or ethmoid sinuses. The proliferation of the mucous membrane in the form of small polyps. In childhood rhinoscopy is used for the diagnosis of adenoid vegetations in the tubal tonsils. If the patient are also frequent nosebleeds. Traumatic injury or a foreign body in the nose. Benign or malignant tumors, etc. In case of these indications the procedure is performed in the doctor’s office and does not require any special patient preparation. Many people often ask the question, what is a rhinoscopy? It is the technique of visual inspection of the nasal cavity, carried out using a special device – a rhinoscope, which are two tubes used for the survey. Inspection should only be trained in this consultation using the special tools. 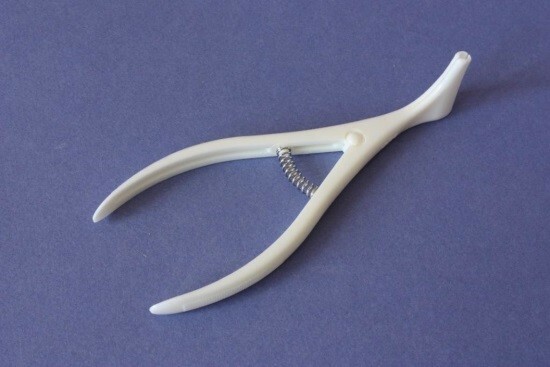 There is a wide range of modifications of extenders intended for use in pediatric patients or when a patient has a deviated nasal septum and other pathological conditions in the nasal cavity. In the examination of children parents must keep their knees face to the doctor, one hand holding the arms and torso, and the second helping to keep the head. READ How much is a laparoscopy? It is very important during the procedure use local anesthetics, allowing to avoid discomfort of the patient and turn off Cihelny reflex. Primary drug for such anesthesia – lidocaine. After the anesthesia the mirror or speculum gently inserted into the initial parts of the nasal cavity and then expands, allowing the doctor to examine her wall. Any kind rhinoscopy does not require physician special training of the patient. The main focus before the event is done on the psychological adaptation of the patient for the upcoming procedure, which consists in explaining to him the progress of the study, and to rhinoscopy. To reduce discomfort and off cauteloso reflex the mucous membrane of the nasal cavity can be treated by local anaesthetic spray. With the possible surgical interventions it is better to use anesthesia that require different conditions of preparation for its implementation. When conducting rhinoscopies research, the doctor should explain to the patient your actions and in any case not to make sudden movements of the device or the patient. When carrying out front-a version of the doctor examines the nasal cavity in the front. For this purpose, or a special curved mirror or rhinoscope in the form of extender. One doctor’s hand holds the tool, and the second he puts on the head of the patient, which allows him to change her situation for better inspection of the nasal cavity. The expander is used to gradually increase the lumen of the nostrils, increasing the area available for inspection. Such an examination is the most common kind of treatments. Initially, the man’s head is level. In this position, the ENT can conduct a study of the primary and the lower nasal passage and part of the nasal septum. After that, the patient’s head slightly tilt back, allowing you to inspect the middle nasal meatus and the sink as well as inaccessible early years Department of the nose and nasal septum. After inspecting a speculum or mirror removed, and the procedure is repeated for the second side. Holding the rear rhinoscopy is the examination of the nasal cavity from the pharynx, which requires the expansion of training activities of the patient. In connection with the introduction into the cavity of the mouth tools necessary to conduct a local anesthetic to suppress possible vomiting reflex. The method is carried out using a putty knife, which the doctor pushes tongue, and nasopharyngeal mirror, allowing you to explore the nasal cavity. It is important to pre-warm the mirror to prevent it fogging when breathing of the patient. Such a survey allows to estimate the ultimate divisions of the nasal passages, turbinates and septum, as well as to examine the pharyngeal tonsils and openings evstafievich pipes. The most modern kind of survey is carried out using a flexible endoscope with a camera and a light source at the end. The method allows for a diagnostic procedure, and a number of simple therapeutic interventions. Endoscopic rhinoscopy allows you to obtain highly detailed image of the walls of the nasal cavity, and also to conduct a direct examination of the places of confluence of the final divisions of the paranasal sinuses, which greatly facilitates the diagnostic process. In addition, the presence of additional equipment, the doctor may conduct a number of simple surgical operations, for example, to remove a polyp, removing a foreign body or burn the mucosa. Undertaking such a procedure is possible only by a specially trained technician, and in availability of endoscopic equipment. The rhinoscopy can be both the front and rear, which undoubtedly increases the possibilities for inspection. Allergic reactions to local anesthetics used or idiosyncrasy to their components. Mechanical damage to the mucous membranes or expanded veins with the development of intranasal bleeding. When complications arise, you must stop and start the symptomatic treatment of these conditions. Visual inspection of the nasal cavity allows the ENT physician to provide accurate diagnosis and prescribe a rational treatment. Diseases of the nose and nasopharynx prevalent at any age and are often the reasons people seek medical care. Easy procedures, low cost and safety of the lead to the widespread use of rhinoscopy for diagnosis of diseases of the nose.